After two rather grim weeks it appears that Winter has finally let go of Leiden an spring has arrived. Judging from how Leideners tried soaking up every little bit of sun over the last few days and the number of people running around in shorts and t-shirts, it appears that everyone desperately needed the sun’s warmth in their lives. As soon as temperatures climb over 15° and the sun is out, people are naturally faced with the decision of where to spend their study breaks in the sun. My suggestion: in the Hortus Botanicus. If you are like me, you’ve spent the last few months that you’ve been living in Leiden looking at this gigantic greenhouse, thinking “this looks amazing, I will definitely go there soon!” but never actually managed to set foot in it. It seems that all it took for me to get off my bum and enter this green oasis in the middle of Leiden was a visit from my parents and a really, really, really stormy and rainy day. Since then, I can’t stop going there whenever I have an hour or two to kill and I’ve completely fallen in love with the beauties hidden in the greenhouses, the little pathways and gardens. First of all, for the ones of you that might not know it: it’s free for students!! This means that whenever you want to visit Hortus, all you need to bring is your student ID card, insert it into the machine by the entrance and off you go. When I went there the first time, the weather forced me to stay inside the greenhouses and I ended up exploring them for several hours. Even though it is only the big main greenhouse that you usually see from the streets, there are actually a few more buildings which feature an amazing variety of plants and also the occasional animal; it’s DEFINITELY worth paying the inside areas a visit when you’re there. However, what I want to direct special attention to in this post is what a wonderful and relaxing study place Hortus is. Although quite a few students come here as soon as the sun is out, it is really not crowded and there are plenty of cosy spots all around the garden area where you can lean back, read a good book, study, take a break from studying or simply have a nap in the grass by the canal. what better place to go for an aimless saunter? A great feature for students who want to do their assignments outside their apartment or the library is the university WiFi, which is accessible throughout Hortus and thus enables people to write their papers while listening to the soothing splashing of the water by Witte Singel. WARNING: it might get too relaxing for serious studying! Although located right in the heart of Leiden, an afternoon in Hortus really makes you forget that you are in the city and should restore your roots with nature fully (it surely does the trick for me). Once you are done relaxing or slowly need to get back to uni, you can take a seat in one of the comfy chairs in the café outside Hortus and have a nice cup of tea/coffee and a slice of cake before returning to the real world. For all the above reasons, this little piece of paradise has become my favourite spot in Leiden to hide away and forget the world – I really recommend a visit to Hortus Botanicus to everyone. PS: should you choose to go there and find me sleeping in the grass by the water, please don’t wake me – I am studying! 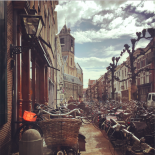 This entry was posted on April 15, 2015 by in Living in Holland, Student Life.